DRESSED UP. Patrons check out the merchandise at a previous Festival in the Pines at Carson Park. A Chippewa Valley tradition is about to get even better. 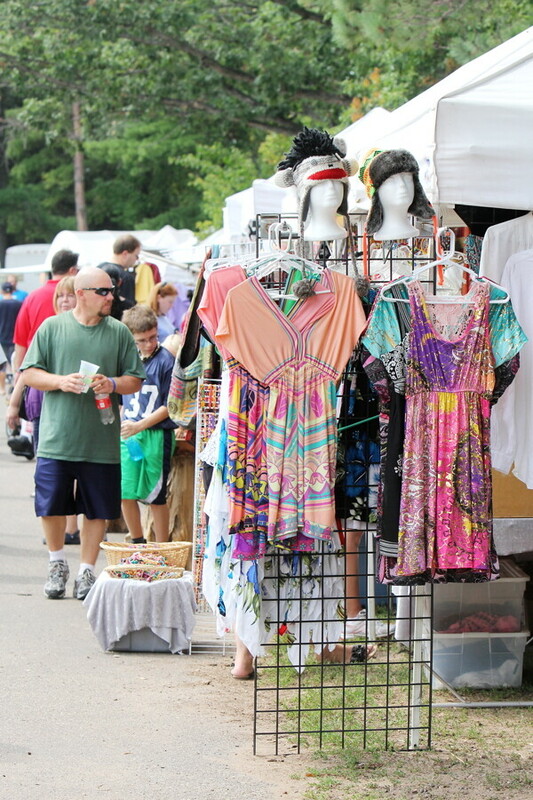 The 36th annual Festival in the Pines will take place in Carson Park on Saturday and Sunday, Aug. 25-26. The festival is back for another year of food, and fun, including craft booths featuring unique handmade items. New this year will be the Festival of Wines in the Pines, an evening concert, an expanded children’s area with child care available, and a back-to-school supply drive for local kids. Andrea Becht, one of the new event organizers, said the new features have been added to the event to “expand the demographics and bring something new and fresh to the festival.” The new features include a little something for everyone. The Festival of Wines in the Pines includes a wine trail consisting of four tasting lounges throughout Carson Park, each featuring a different atmosphere and showcasing live talent and craft foods. Festival goers will pay just $10 for a wristband to do the wine tour, which includes four glasses of wine and a Festival in the Pines commemorative glass. There will also be a new Saturday concert featuring Nick Anderson & The Skinny Lovers from 2-4pm, Irie Sol from 4:30-7pm, and Brat Pack Radio from 7:30-10:30pm. This year, parents can drop off their children in the expanded kids play area and subscribe to a babysitting service while they shop and enjoy all that the festival has to offer. Festival in the Pines l has a tradition of giving to the community and is expanding on that this year. The festival will continue to support Wisconsin Indian Head Country, an organization which annually organizes and hosts the Governor’s Fishing Opener and an Annual Fun Day Bus Trip to promote tourism. Festival in the Pines will host many service clubs and non-profit organizations at the event. Debuting this year will be a “Stuff the Bus” supply drive to benefit local students. The Stuff the Bus drive was inspired by Eau Claire Transit, which identified the need of some local students for proper back-to-school items including backpacks, pens, and paper, Becht said. To respond to this need, Festival in the Pines, Eau Claire Transit, Midwest Family Broadcasting and the Boys & Girls Club are collaborating to literally fill a bus with the much-needed supplies. To learn more about the festival, visit festivalinthepines.com.